The event still revolves around cars and trucks, but startups that make tech to supplement driving have a strong presence this year. Out of habit, we often still talk about technology as though it’s an industry in and of itself, despite how outdated and limiting this way of thinking can be. The fact is, technology has found its way into industries that pre-date it, such as the automotive industry, and it now shows immense promise to address some previously accepted challenges associated with driving. Fossil-fuel guzzling, human-operated machines come with safety risks, expenses ranging from insurance to maintenance and major inefficiencies of traffic, commuting and parking. Technological developments in other industries are now being applied in the auto and transit sector to transform it -- and to make these types of issues seem surmountable, not inevitable. Tech startups and legacy automakers both have the opportunity to showcase their products at this month’s largest conferences. Last week in Las Vegas, analysts circulated the idea that CES is increasingly becoming a “car show.” And while traditional car shows still place more of an emphasis on ready-for-market vehicles than CES does, the blurring of tech and auto showcases underscores that the auto industry senses it’s time to adapt. That’s why this year's Detroit Auto Show (a.k.a. the North American International Auto Show, or NAIAS) is not limited to big car companies with flashy press conferences and exhibitions. For the second year in a row, a showcase for startups called AutoMobili-D has floor space at the event. Organized by Detroit-based Techstars Mobility, this year’s AutoMobili-D showcase features 57 companies from 11 countries. Collectively, the startups at Automobili-D have raised $157 million in venture capital funding and employ 755 people. Nearly 90 percent of them already have relationships with automotive and tech companies, according to NAIAS, but their presence at the event brings the potential for additional partnerships to arise. This doesn’t necessarily mean they’re looking to get acquired by one particular automaker, though some may well go that route. The Automobili-D showcase at the Detroit Auto Show is open through Jan. 21. For a full list of participating startups, see this release from NAIAS. Click through the slides to learn about some of the startups shaking up the auto industry. Some of the startups at Automobili-D envision after-market direct-to-consumer products, i.e. Stroma Vision, which Entrepreneur previewed briefly last week at CES (see below). The Istanbul-based company has created a device that sits on a vehicle’s windshield and tracks a driver’s eyesight to reduce accidents. If a driver is looking at their phone or appears tired or otherwise distracted, the device will light up to get the driver’s attention. The company envisions the device, which has been in development for six months, selling to consumers for about $200, and seeks interest from insurance companies, driving schools and more. 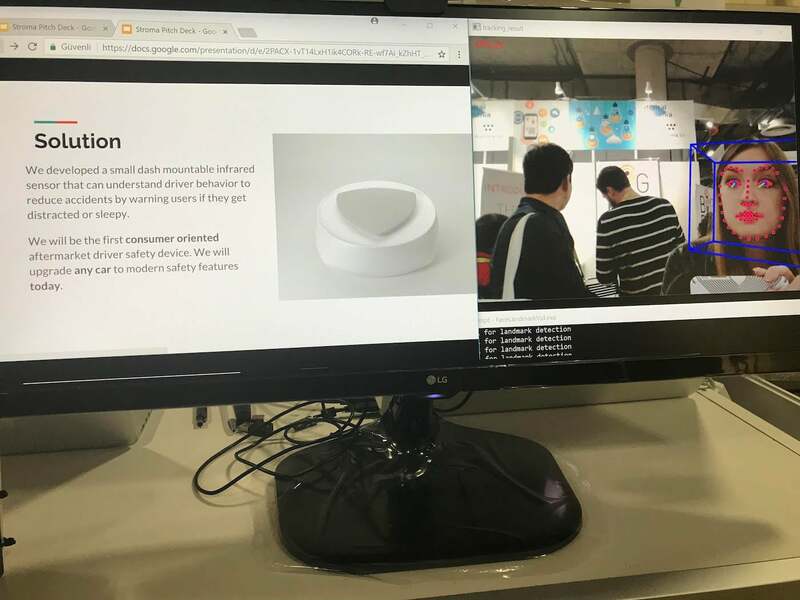 Stroma Vision had a booth at startup hub Eureka Park at CES 2018. Another company trying to prevent accidents is Derq, which is developing artificial intelligence to monitor behavior at intersections, detect surrounding conditions and send signals to other vehicles. This type of technology is known as V2X, which stands for “vehicle-to-everything communication,” and is central to the development of self-driving cars. Taking safety even further via sensors, a product from Tel Aviv-based Caaresys detects heart rate, respiration and other health metrics of a vehicle’s driver and passengers and can tell whether they’re awake or under the influence. Pay by Sky bills itself as an “autonomous parking payment system,” because, if whether or not you’re riding in an autonomous car, it’s becoming less and less acceptable that parking fees can’t be taken care of automatically. With Pay by Sky, users don’t have to manually pay for parking via smartphone or even a meter. When they park in certain areas, their vehicle will be detected and they will be charged automatically. Parkofon works similarly. Parkbob is working to digitize parking laws, prices, time limits and more and shows drivers what’s available nearby via app. Carma Car is inspired by the ease and convenience of all-in-one subscription services. It’s not a sharing economy service -- it allows users to subscribe to a “full-time vehicle,” month to month, rather than signing a longer lease or purchasing a car. The idea is that users would make one payment per month that covers everything, from insurance to maintenance. Other Automobili-D startups include Seeva Technologies, which heats wiper fluids to defrost windshields in a minute flat; EcoG, which develops electric vehicle charging stations that can be deployed outside all kinds of commercial settings; ReviverAuto, which makes the RPLate digital license plate to reflect vehicle registration, personalized designs, targeted marketing messaging, emergency alerts broadcasting and more; and AirspaceX, which makes an electric passenger drone.